A lot of players use Bombarian up into the 4500+ trophy range and it can be used starting at BH5 all the way up through BH7. The general strategy is fairly straightforward - drop a few Raged Barbarians as a distraction to defenses, take down the outside walls with Bombers so you can trickle 3-5 in at a time, take down the core walls, then flood the base with Raged Barbarians to overwhelm the defenses. This is NOT a "spray and pray" strategy - you have to pick the right side of the base to launch your attack, and pathing is important, especially when dealing with the Crushers which will end a Raged Barb attack in a heartbeat. You don't want to just dump your Raged Barbarians and let them run - you have to take them in, a little at a time, until you have a couple of key defenses down and the core is open. 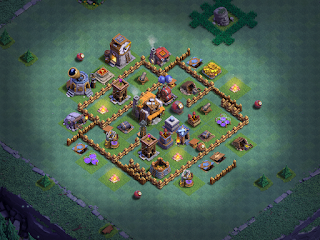 This attack works best against diamond bases and box bases that are open in the middle (so, walls around the outside but not much on the inside). It really started being used at BH5 against diamond bases - you hit the apex of the base, work the sides with the Bombers, then flood the juicy center. Things that will complicate the attack really center around pathing - if the base can redirect your Raged Barbarians toward the Crushers, or split them up in a way you don't want them to, it will bust up the attack flow. Bases that are heavily compartment based will be problematic, as your troops will spend time beating on walls. Well placed Mega Mines will also disrupt the attack, but if you trickle them your Raged Barbarians into the base, they'll find the mines and trip them early on. As I went through and learned the basic concepts behind the Bombarian strat, I noted things to do/not do. Below is that list. I also have a link at the end of this article that goes to a video where I discuss the attack and offer up a bunch of replays, starting with some early, low percentage destruction and ending in some 3-star friendly challenges. Hopefully, you will find this information useful. If you have any questions, feel free to shoot me a note or catch me on the forums. Initial deployment vector is typically at a point where there are as many buildings between your drop point and the Crushers as possible. The Crushers are the #1 enemy of Raged Barbarians. Ideally, start by clearing outside buildings and provide a distraction for the Bombers to open the base. Try to pull the Guard Post troops in the same way we pull the Clan Castle troops on the main game. As the attack progresses, open a second front on a part of the base where there are non-defensive structures. Save the 4th Bomber to deploy there so you can open it up as well. If the base has a section with no defenses, that may be a good spot to start the secondary attack. Early Battle Machine deployment is usually NOT the way to go; it’s better to hold off until the core has been opened and a funnel to the BH created. You can also use the Battle Machine to take down a Crusher. It’s possible to time a rush of Raged Barbarians to take the Crusher down just after it has dropped on another troop (such as the Battle Machine). The Battle Machine also serves as a distraction to other defensive structures - like the Giant Cannon, Cannons, Double Cannons, Hidden Teslas, and Roaster - while your Raged Barbarians are taking them down. You’ll want to get to the Giant Cannon quickly if you can, same with the Roaster - these will cause your attack grief, in general. Note that a level 7 Roaster can take down a Raged Barbarian in a single volley and since it deals splash damage, it can decimate a group quickly. As the attack winds down, you want your remaining troops to continue taking down buildings for additional destruction points. The Bombers, if kept alive, will clear a few along the way as well. This is especially the case if your main attack clears various defenses in advance of the Bombers (they’re pretty slow moving, after all). Patient deployment of the Raged Barbarians is key to this attack’s success. Bombarian is much like Mass Beta Minions - the Raged Barbarian is the Beta Minion of ground attacks. However, if you deploy them in a single tap or just go too fast, they tend to get wiped out quickly by the defenses (there’s more that can go after them than we see in air attacks). So it’s better to run this attack in a surgical fashion, trickling them in a few here or there, and spreading them out a bit. It’s also important to watch out for high HP structures - more Raged Barbarians are needed to get these down quickly.